I’m so happy to share this colorful bedroom makeover I completed for my client in Oak Park! The client was very into color and we created the perfect sanctuary for her. There are many bold colors happening in here, but it’s not overwhelming. Here I’ll talk about how I made that happen and share how I worked with some of my favorite local vendors to create this space. Check out the before and then scroll down quickly! The mandates for the space were a larger functioning dresser, new nightstands and an oversized comfy chair the client could lounge in with her 3 kids. The bed and vintage dentist’s chest were the only items that had to stay. There was so much warm woodwork in the room, I wanted to let that shine while adding color that would complement. The client didn’t want a shade too dark to swallow the room so we ended up going with Benjamin Moore Gibralter Cliffs, a lovely mid-tone, blue/ green grey. We went bolder on the ceiling with Benjamin Moore’s Yorktown Green, which works because it was contained by the thick crown molding. The existing bed was upholstered in a grey fabric so we went with Ivory bedding, which is a little less scary with 3 kids and a dog. I used a washed velvet quilt with a down blanket underneath in lieu of a duvet. Bold pillows keep the bed from looking washed out. The client loves a clutter free nightstand so we opted for hardwired wall sconces and nightstands with ample storage. I will never spec a nightstand without drawers! 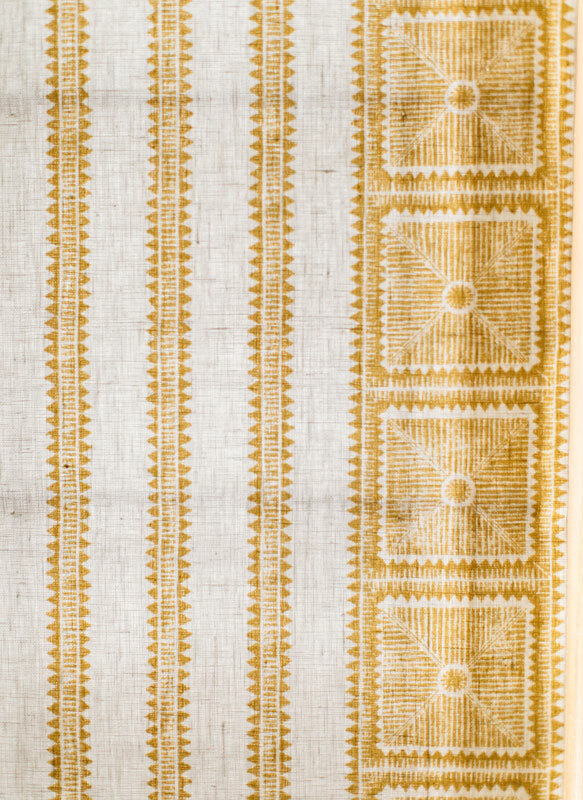 I knew we were making some bold color choices elsewhere so I opted for a neutral rug with a subtle traditional pattern. This little nook in the room was perfect for a seating area and the Room and Board Modern Eos swivel chair was the perfect shape and size. It’s deep enough to curl up in with a couple of kiddos and the flokati rug is great to addition to make a spot like this even more cozy. 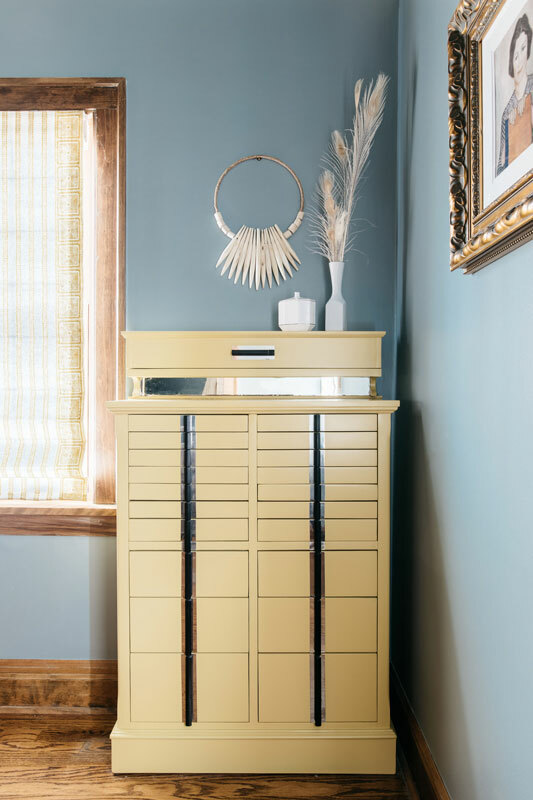 The client has had the vintage dentist’s chest used as jewelry storage since high school and the dark color it was didn’t highlight all the drawers and interesting hardware. I worked with Ashley from Vintage Refined for refinishing and the piece totally came to life! We used Benjamin Moore’s California Hills- a more muted mustard that is dreamy like a lemon creamsicle! HOT TIP- when using lots of color in a space choose a less saturated version on larger items and add those saturated pops with textiles! I knew that roman shades were the best window treatment option for the room. I worked with my friend Kathryn of Maresca Textiles to create a custom color of her Palazzo Stripe. I met Kathryn about a year ago after she moved her business from Savannah to Chicago. She went to RISD for textiles and I went to SCAD and we are almost the exact same age so we were pretty much meant to be friends. When you work with small local businesses who manufacture in the US, it’s so easy to do custom. The designers love seeing their work in another light and for anything that’s already made to order there’s little extra lead time. To speed up the process for sampling the custom Palazzo Stripe I referenced a print color that was already in Kathryn’s line. I love how the shades turned out! The slubby white linen ground and print texture make them subtle enough to not compete with anything, but add so much interest to what could have been a perfectly safe white linen shade. It was a no brainer to turn to Megmade for a dresser. Both husband and wife had to share a dresser so I wanted it to be as long as possible. Most larger scale furniture of today is either heavy and traditional or boxy and modern. Vintage dressers over 65” long are a little more rare, but of course Megmade had just what I was looking for. I also didn’t want the dresser to be a wood finish because it would be adjacent a wall of wooden closet doors. We chose satin black and the handles were left in the original brass finish. I opted for a large mirror with curves that smile back at you! FUN FACT- the mirror was shown online hanging vertically but I contacted the vendor and asked that they reattach the cleat hanging mechanism horizontally before shipping it. Since my client loves color and supporting local businesses it was natural that I introduced her to local artist, Kristi Kohut. She loved the piece I proposed, but took the time to visit Kristi at her Libertyville studio to get to know her and her work a little better. We could have bought a print from one of the sites Kristi is represented on, but buying directly from the artist ensures they get the full sale. It’s even better if they are local and you can get to know them, the piece you invest in will be all the more meaningful. This was a super fun project with a great client who cared about all the same things as me- nightstand drawers, supporting local businesses and of course COLOR! Thanks to Margaret Rajic for capturing it all.